on the scenic Saranac lakes that were notable for their distinctive roof gables and rustic as well as Tudor inspired styling. Coulter's camps proclaimed this wilderness to the wealthy. 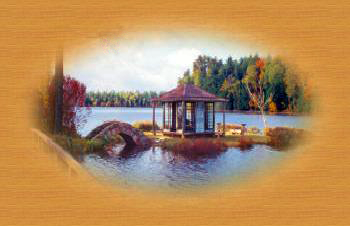 On Upper St. Regis lake, the richest woman in the world, Marjorie Merriweather Post, built her own Great Camp in the 1920's, the lavish Topridge, while at the nearby White Pine Camp with its very picturesque Japanese teahouse, President Coolidge even spent a summer fishing. 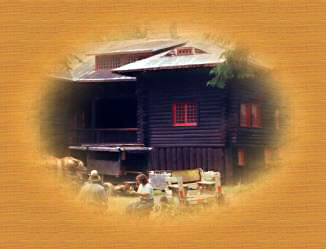 A log villa set in the heart of the Adirondacks, Santanoni, possibly the grandest camp of its time, tells a different story. Donated to New York state, the camp deteriorated over many years but is now staging a comeback with the help of state and local government as well as the preservation community. To visit Santanoni is not easy yet the reward is to be a guest at nature's own Great Camp.